The mystery of the iconic bar's giant George Washington head. Brandon Fox Buddy's giant George Washington image signed by celebrities. 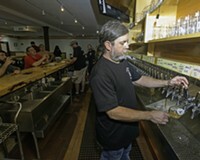 Buddy's Place opens tonight and faithful diners will find a space that's bigger, brighter and cleaner. In other words, an upgrade. The old knickknacks that were collected on its walls traveled along with the restaurant to its new location in the old Viceroy space at 600 N. Sheppard St. "We tried to make it as much like [the old] Buddy's as we could," co-owner Marion Dealto says. You'll find the restaurant's beloved stuffed buffalo head — a creature with an exceptionally patient look on its face — hanging in the back. 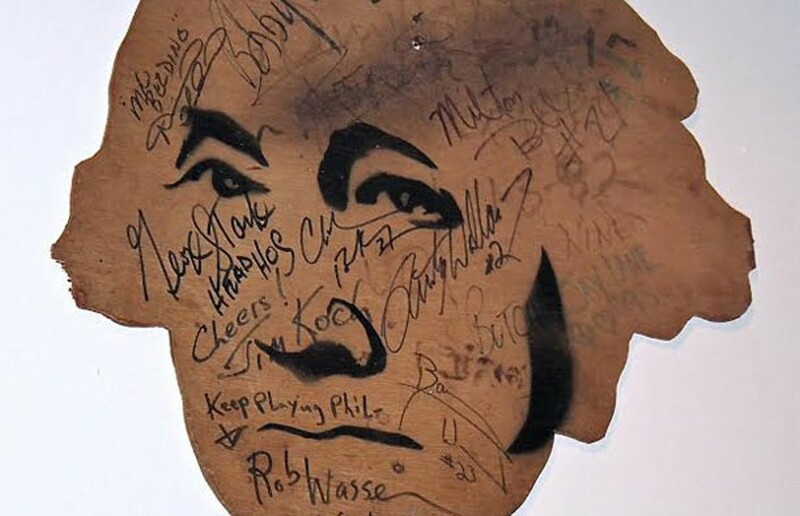 You'll also see its large George Washington head painting signed over the years by an eclectic collection of celebrities including NASCAR driver Rusty Wallace, the co-founder of Boston Beer Co. (which makes Sam Adams) Jim Koch, and Grateful Dead founding member Bob Weir. But where did G.W. 's head come from and who made it? Dealto couldn't recall. "We've had it forever," she says. Those of you who went to VCU in the 1980s — and/or friends of Gwar — might recall the artist. Jeff "Stretch" Rumaner was a graduate student in the sculpture department back then and briefly (very briefly) made appearances in a few Gwar shows when the band was starting out. In 1988, an important First Amendment case came before the Supreme Court. Students sued Hazelwood East High School's principal for preventing them from publishing articles about divorce and teen pregnancy in the school paper. Ultimately, the Supreme Court decided that schools have the right to restrict students' free speech when they deem it necessary. To remind people about the importance of the first amendment, Rumaner stenciled 100 or so wood cutouts with the iconic image of the founding father. Along with three friends, he drove around town, and with a very long ladder, nailed the paintings high up on telephone poles across town. Street art — before there was street art. "The police tried to arrest us three times," Rumaner says. "Every time, we told them they were part of the 'George Washington parade' and they believed us." He adds (unnecessarily), "And we were drunk when we put them up." Later, George Washington University bought four primary-colored versions of the heads at a gallery show in Arlington. Today, Rumaner owns two restaurants in Kansas City, Missouri, called Grinders, was the star of Animal Planet's "Eating the Enemy" in 2012 and continues his work as a sculptor. "Some of them are signed with my last name on the back," he says. "They should take a look." 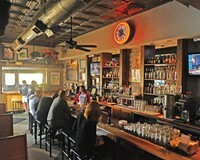 What’s next for the restaurant soon to be known as the former Buddy’s Place?